What can fantasy owners learn from PFF data? There are so many premium tools available here at PFF that can give you edge in your leagues. In our latest series, we take a look at some of the top fantasy producers over the past three seasons and identify some PFF Signature Stats they excelled in during that period. In addition, we will try to spot trends of younger players that have enjoyed similar success in those areas in smaller sample sizes to help identify some potential rising fantasy stars. No quarterback has thrown more touchdowns since 2015 than Brady (96) and only Aaron Rodgers has seen a larger percentage of his pass attempts during that span result in a score. The Patriot signal-caller has seen 5.9 percent of his passes go for a touchdown since 2015. One of the things Brady does well and the Patriots employ effectively is the play-action pass. The veteran attempted (150) and completed (10) more play-action passes than any other quarterback in the league a year ago and has ranked sixth in percent of play-action (%PA) in back-to-back seasons. Another quarterback that has been consistently inside the top 10 in % PA since 2015 is Marcus Mariota (top 11 three years in a row). Only Russell Wilson and Kirk Cousins threw more TD passes on play-action plays in 2017 than Mariota. His ability to tuck it away and run with it makes even tougher for opposing defenses to defend. Wilson was last year’s top fantasy quarterback. He only finished 11th in passing yards (3,983) but led the league in passing touchdowns (34) and was second at the position in rushing yards (586). His ability to make things happen has allowed Wilson to remain a viable fantasy commodity despite playing behind one of the league’s worst offensive lines. The Seahawk took longer to attempt a pass (2.88) than any other quarterback and 13 of his 34 TD passes came when he held the ball 2.6 seconds or longer. Wilson has been a top-three fantasy QB three times in four years and finished inside the top three in time-in-the-pocket numbers each time. DeShaun Watson’s ability to move around the pocket led to both him and his teammates being valuable fantasy commodities during his brief stretch of success before a season-ending knee injury. Watson finished behind only Wilson and Tyrod Taylor in his time in the pocket rating last year. He held the ball 2.6 seconds or more on 10 of his 19 TD strikes. Accuracy has always been something Brees excelled at and since 2015 no passer has completed a higher percentage (69.99) of passes (min. 300 attempts) than the Saints’ signal caller. He also ranks first in passing yards (14,412) and second in TD passes (92) during that span. Brees has always shown a steady hand in the pocket and he’s finished in the top three in adjusted completion percentage when under pressure in three of the last four seasons, including a league-best 72.8 percent a year ago. He also finished in the top two in adjusted completion percentage in four of the past five years. For the second straight season, Dak Prescott finished 10th in adjusted completion percentage (74.3), but he didn’t perform as well when under pressure as he did as a rookie, dropping to 15th (68.0) after finishing fourth (75.8) in 2016. Cousins finished inside the top 10 at quarterback for the third straight year in 2017, something only two others (Brees and Matthew Stafford) have accomplished. He has averaged 4,392 yards and 27 passing touchdowns while rushing for 14 scores over that stretch. Now in Minnesota, he’ll look to keep that production going. A big factor to whether or not he’ll be able to continue having success in his new home will be whether or not the Vikings’ offensive line can keep his pocket clean. Cousins finished sixth in passing accuracy when not under pressure last year and has been inside the top eight in that category in each of the last three seasons, including in 2015 when he led the league 84.1 accuracy percentage. Jared Goff took a big step forward in his second season and in his first year under Sean McVay. With a new and improved playbook and added beef upfront for the Rams, Goff was able to finish inside the top 10 in accuracy percentage when not under pressure as well, ranking ninth among all passers that played at least 50 percent of their snaps. He finished 22nd in the same category as a rookie. 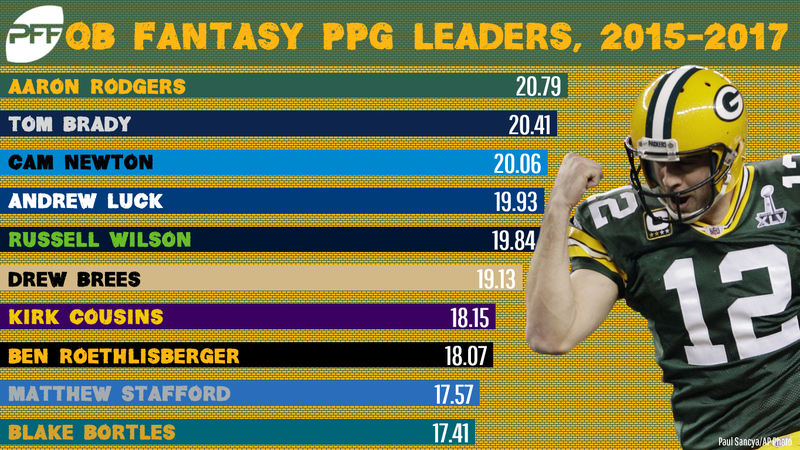 Stafford has finished in the top 11 in fantasy points six times in seven years. He wound up as QB6 in 2017 on his way to passing for 4,446 yards and 29 touchdowns. Since Jim Bob Cooter’s promotion to OC during 2015, he has completed 66.3 percent of his passes while averaging 272 yards per game. The ability to successfully throw the deep ball is one that not all quarterbacks possess. Stafford ranked fourth with a 44.6 accuracy percentage on passing attempts 20 or more yards downfield last season after finishing 12th a year earlier. Big plays led to Stafford turning in his best fantasy effort since 2013. Before going down to a late-season knee injury Carson Wentz was in the MVP conversation. Part of that success can be attributed to his success on throws of 20 yards or more. Wentz ranked fifth in deep passing accuracy in 2017 (44.6 percent) after finishing 19th among qualifiers just a year earlier.